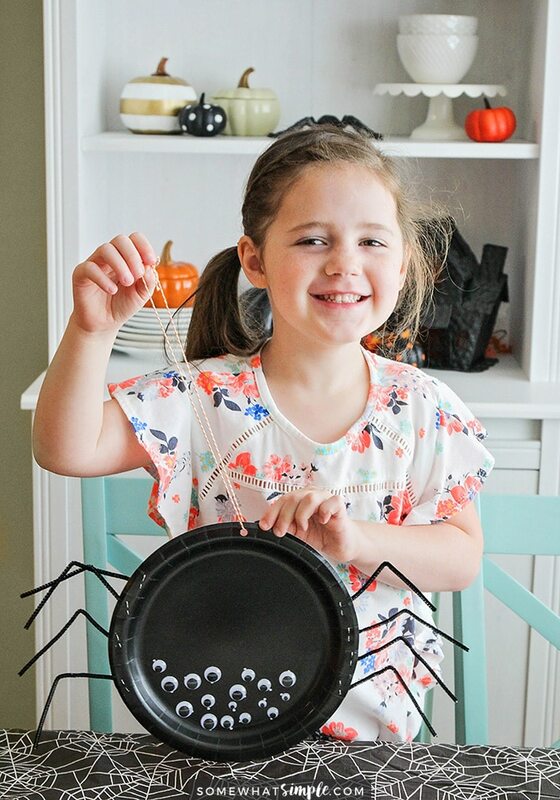 This simple and fun Halloween party is the perfect way to celebrate the season! 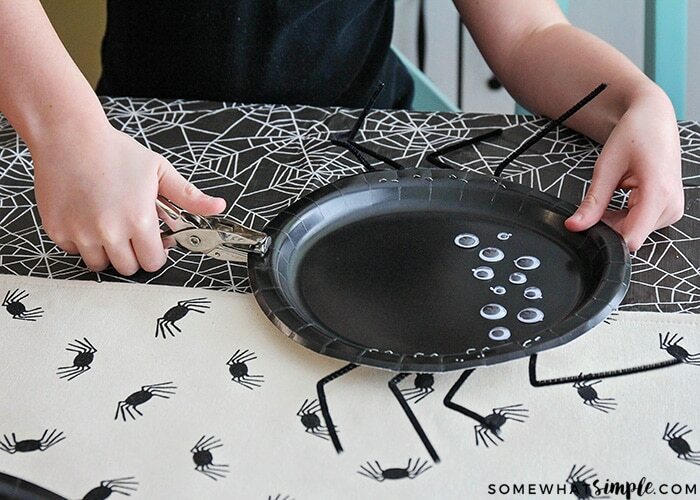 Enjoy an adorable Itsy Bitsy Spider craft for the kids, plus spooky and delicious treats! It’s finally my favorite time of year! Halloween is my family’s favorite holiday, and we love to celebrate all month long. Between decorating the house top to bottom, baking delicious and spooky treats, and creating fun Halloween crafts, it’s definitely the best time of the year! 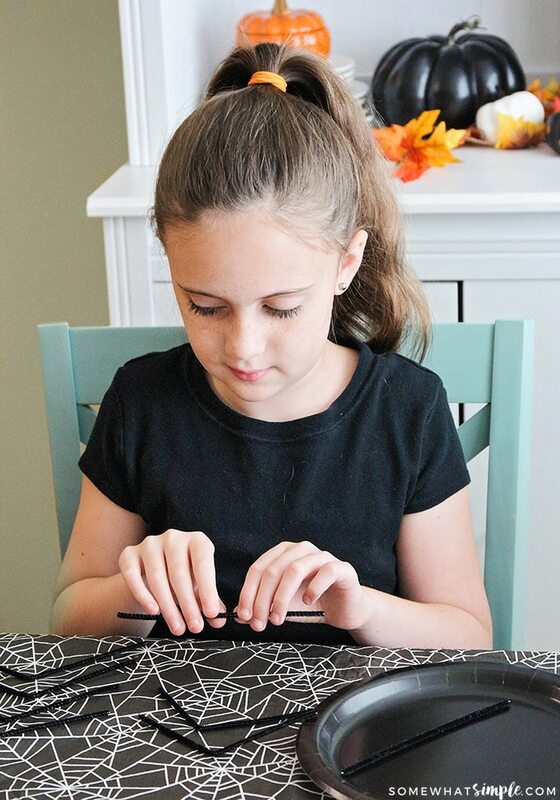 This Halloween craft party is the perfect way to get in the mood for Halloween, and get the kids involved too! I started with some fun Halloween snacks, since they are an essential part of any celebration. 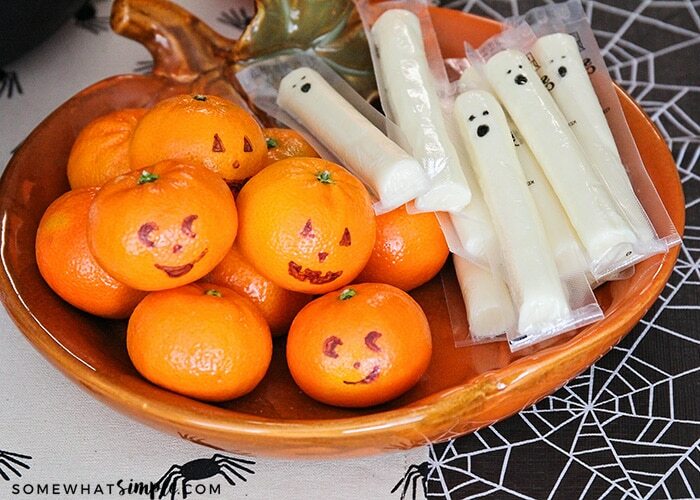 We kept things simple and easy with some string cheese, clementine’s, and a few Butterfinger candies, just for fun. 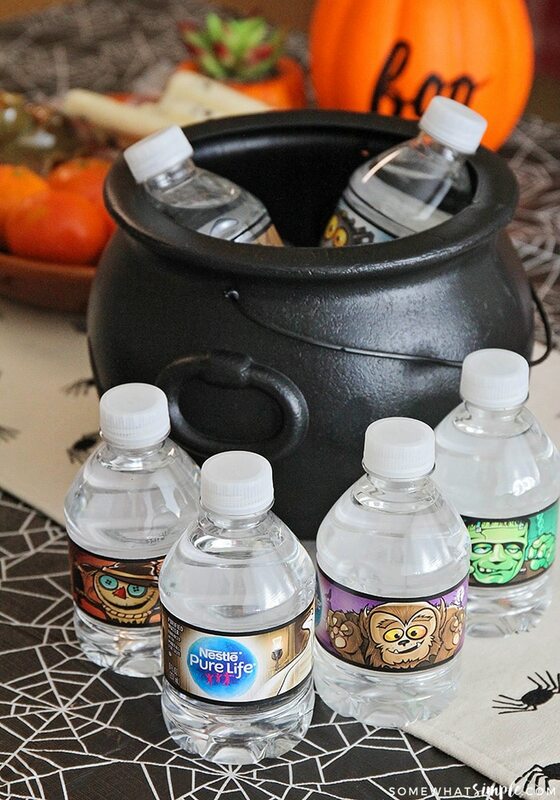 I also added some adorable Halloween limited-edition water bottles from NESTLÉ® PURE LIFE®. 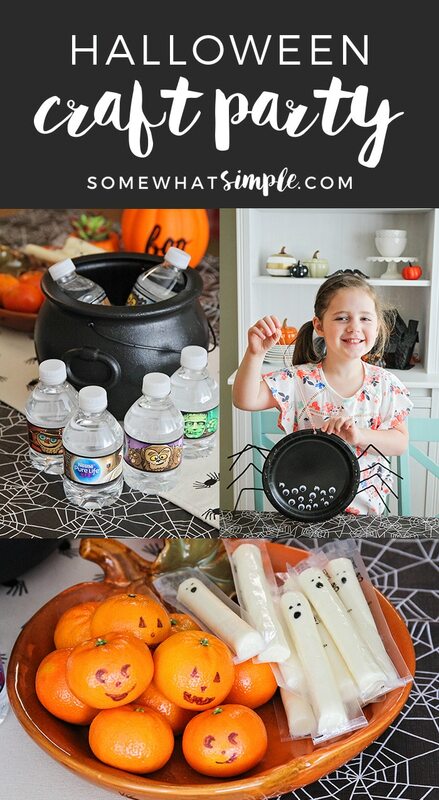 Healthy hydration is essential all year long, and these adorable Halloween-themed bottles make it easy and fun. 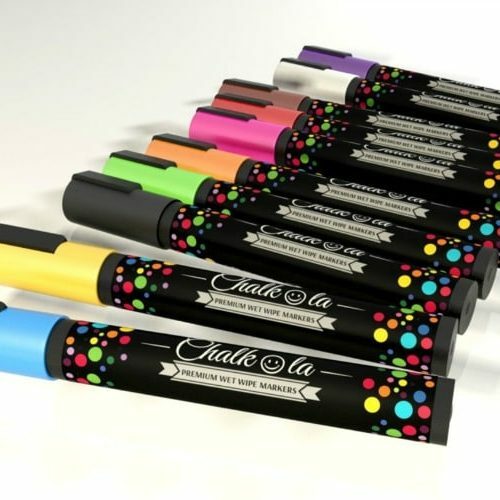 They are the perfect size for little hands, and my kids also love the fun designs! 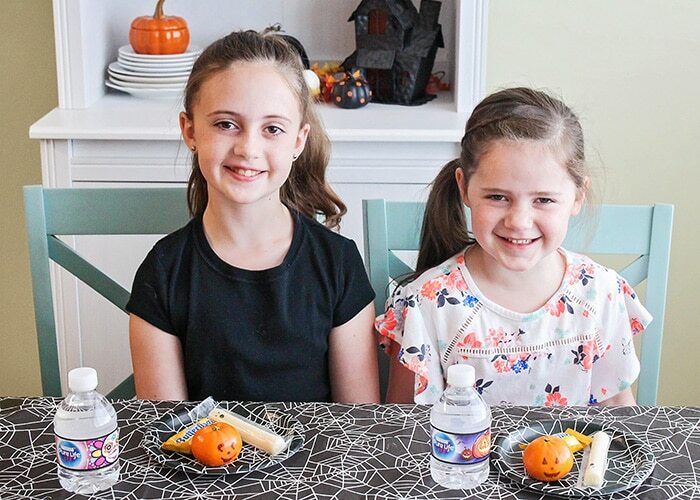 NESTLÉ® PURE LIFE® 8oz water bottles are the perfect size for trick-or-treating, making it easy for kids to stay hydrated throughout the night. 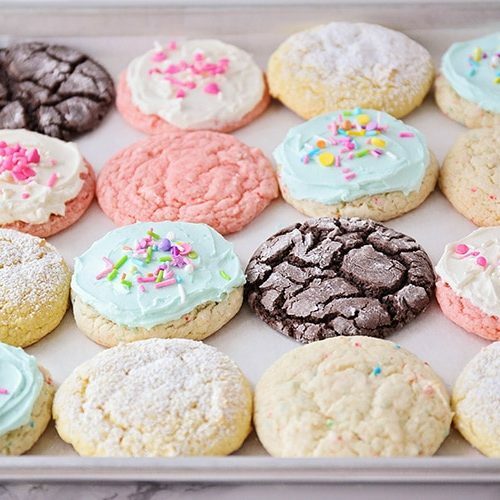 They’re also great for class parties or neighborhood get-togethers! Replacing a single 12-ounce, 140 calorie sugar sweetened beverage with water each day for a year can cut more than 65 cups of sugar from one’s diet. Kids have many choices when it comes to beverages and, unfortunately, research suggests that water is not always top of mind. 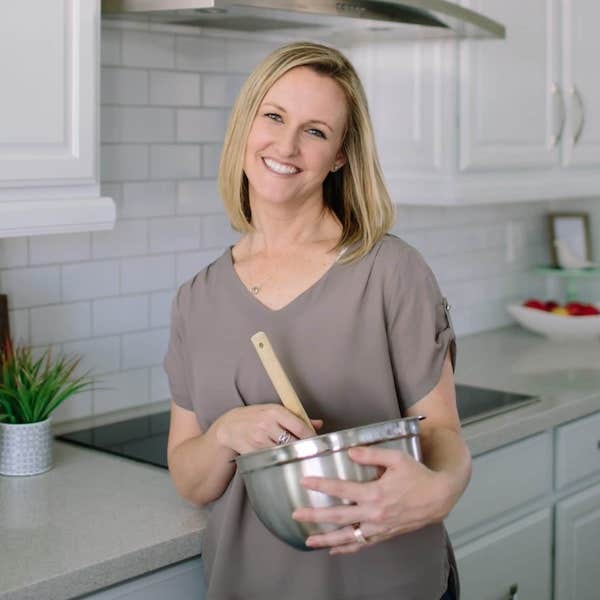 In a 2015 survey conducted by NESTLÉ PURE LIFE, moms and kids revealed many surprising insights about their hydration habits. More than half of US kids are inadequately hydrated. Up to 75 percent of kids report not drinking any water before school and that roughly 25 percent of kids report not drinking any water on two consecutive days. I love that these cute little bottles help my kids get the healthy hydration that they need, in a fun way! To learn more about NESTLÉ® PURE LIFE® and find the limited edition bottles at a store near you, visit nestlepurelife.com. 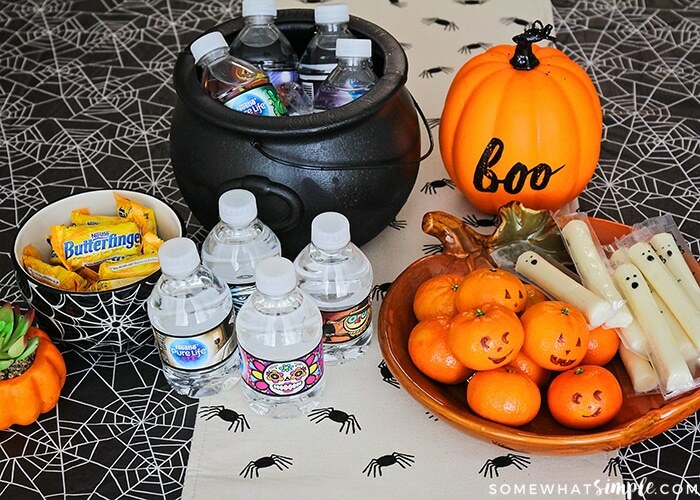 Show us how you use bottles in your Halloween festivities with the hashtag #HydrateYourHalloween and by tagging @nestlepurelifeus. To make the clementine’s and string cheese extra fun, I drew little jack-o-lantern and ghost faces on them with a black permanent marker. It was a little thing that only took a few minutes to do, but my kids loved them! 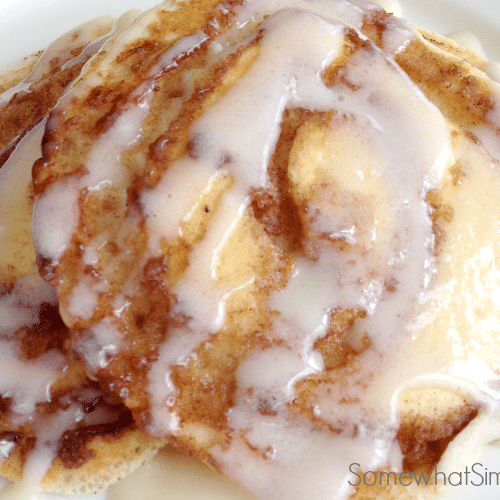 Once I had our snacks ready, I wanted to do a fun and easy craft with the kids. 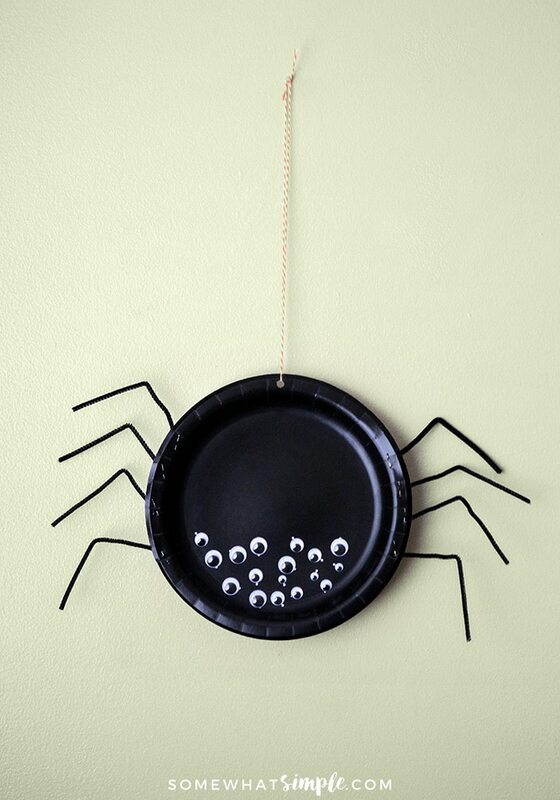 I found these adorable paper plate spiders on Pinterest, but I wanted to put my own twist on them. 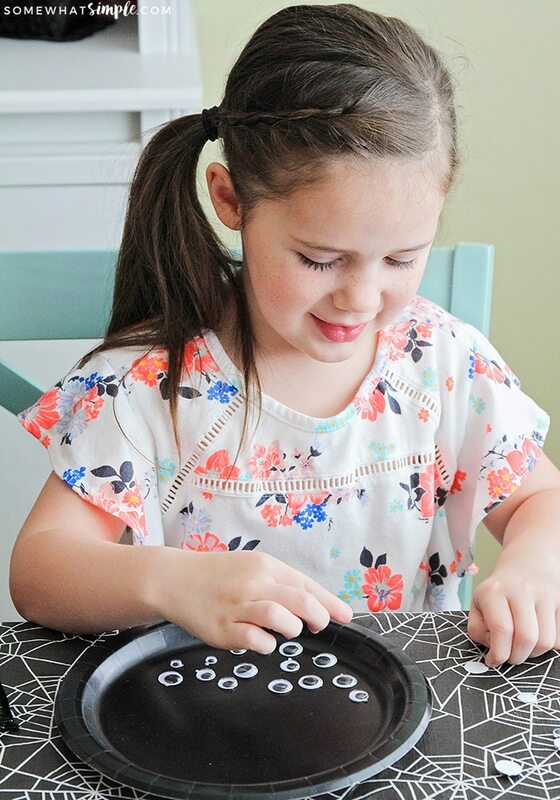 We used black plates and pipe cleaners, but you could easily change things up by changing the colors, adding glitter, or using different size plates, or different lengths of pipe cleaners. 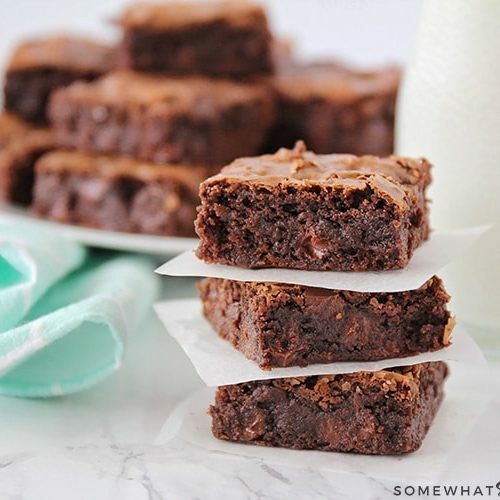 They’re so simple and fun to make! Bend each of the pipe cleaners in half to form the spider’s legs. Glue the googly eyes to the bottom of the plate in a random pattern. 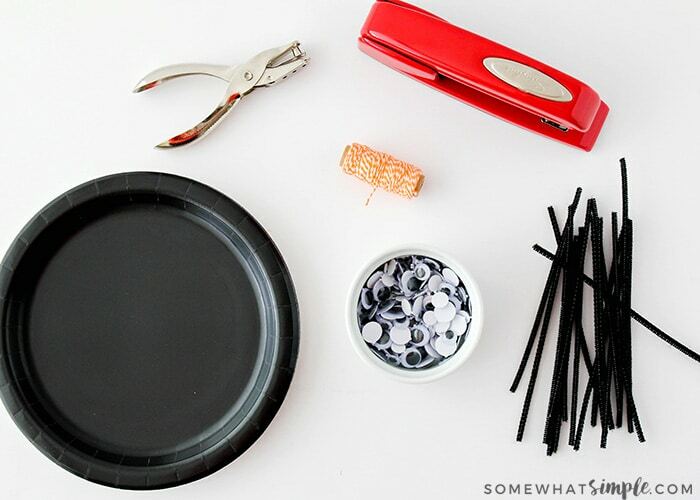 Punch a hole in the top of the paper plate and string the twine through it. Tie the twine at the top to form a loop. You’ll start by bending each of the pipe cleaners in half to form the legs. 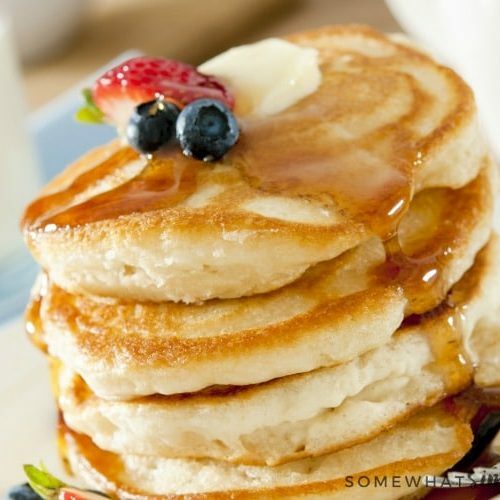 Next, you’ll attach your googly eyes to the bottom of your plate. I was really excited when I found self-adhesive googly eyes, thinking they would save on some mess, but they were a little challenging for my six year old to peel and stick. Regular googly eyes would work just fine. Just attach with a little dot of glue, and you’re all set! My kids loved adding eyes of all sizes in totally random patterns. So fun! The trickiest part is definitely stapling on the legs. 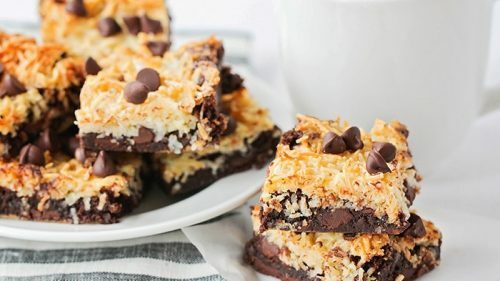 I found that it worked best to turn the plate over, hold the pipe cleaners in place with one hand, then staple through to the front of the plate. I helped my six year old, but my ten year old was able to do her own. If you don’t want the hassle of stapling, you could also use masking tape to attach the pipe cleaners to the back of the plate. The next step is to punch a hole in the top so you can hang the spiders from string or twine. And voila, the spider is complete! My kids had so much fun making these, and thought they were funny and spooky too. After a fun afternoon of crafting, these girls were ready to enjoy a delicious snack and some healthy hydration. 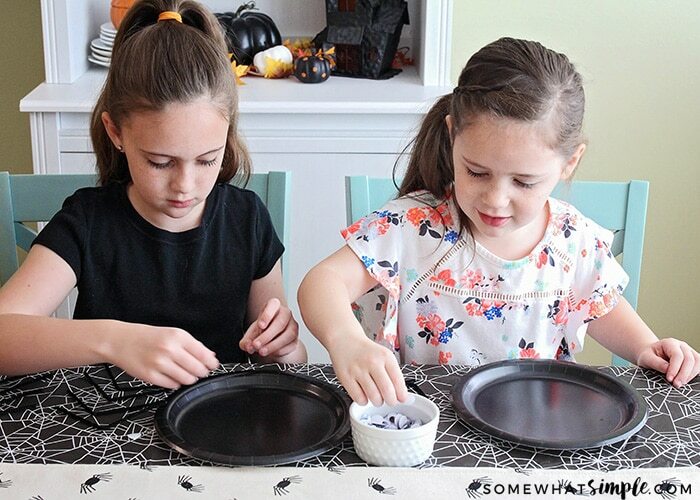 This Halloween craft party was the perfect way to kick off our Halloween festivities for the year! 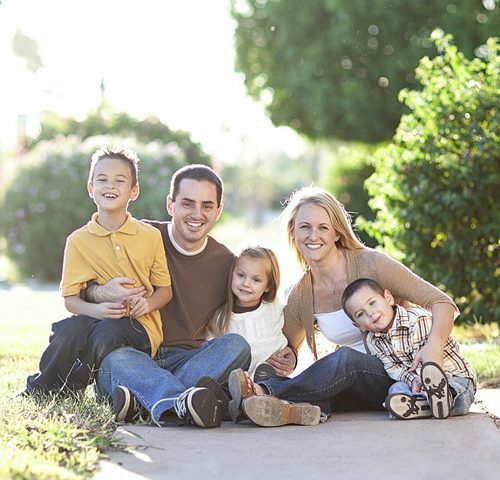 For more information about NESTLÉ® PURE LIFE®, be sure to visit them on social media! Show us how you use Nestlé® Pure Life ® 8oz bottles in your Halloween festivities with the hashtag #HydrateYourHalloween.